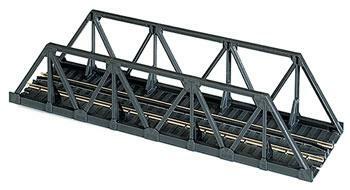 This is an N Scale Warren Truss Bridge from Atlas Model Trains. Retail $8.50 SAVE 24% ! this is a nice little bridge. 5 long with atlas track. can&apos;t beat it at this price. will be placing two of them end to end to make it a double crossing. so order several when you get yours. Designed to work with Atlas N scale railroad layouts or dioramas. One piece black plastic bridge. Wide bridge has a track running down its middle, and a pathway on each side. Only requires connection with N scale track. Keep safely away from small children. Bridge is the same length as a standard 5" straight section and may be placed atop the #2543 bridge pier (ATLU2543).